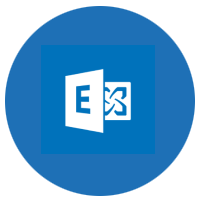 You can connect to your Microsoft Exchange Calendar using multiple options. The Meeting Room Schedule allows you to connect to a calendar associated with user account as well as to a resource calendar. A resource or room calendar is usually associated with a resource which is a meeting room, conference room, auditorium, training room etc. You can use the app to display the schedule of the resource on a wall mounted tablet, so that participants can easily locate as well as browse through the upcoming events. Follow the below steps to set up your resource calendar and display in Meeting Room Schedule app. Log on to your Office 365 admin portal. Click on + button to add a new room. Enter a name and email address for the room and add the room. In the main navigation, go to Users > Active Users. Select the user corresponding to the room and reset the password. Read here to know about resource calendar set up in Exchange. Step 2 for O365: Get .asmx link for your meeting room. Step 2 for Exchange: Get .asmx link for your meeting room. If the link above does not work, read this article to know about getting the .asmx link for your resource. If you don’t have a password already defined for your resource, reset the password to get a new one. Click reset password after selecting the resource mailbox in the active directory or active users list. Step 4: Connect to Meeting Room Schedule. Install Meeting Room Schedule in your android device. Tap and select the option Settings from the top right of the main screen. Select Save & Exit to go to the main display screen. Here you’ll find a complete list of advanced settings. How to access powershell? Check this documentation from Microsoft. If want to connect to a Microsoft exchange calendar of a user account, follow Step 3 and Step 4 as above. The .asmx link is same for resource account and user account, only the credentials will be different.